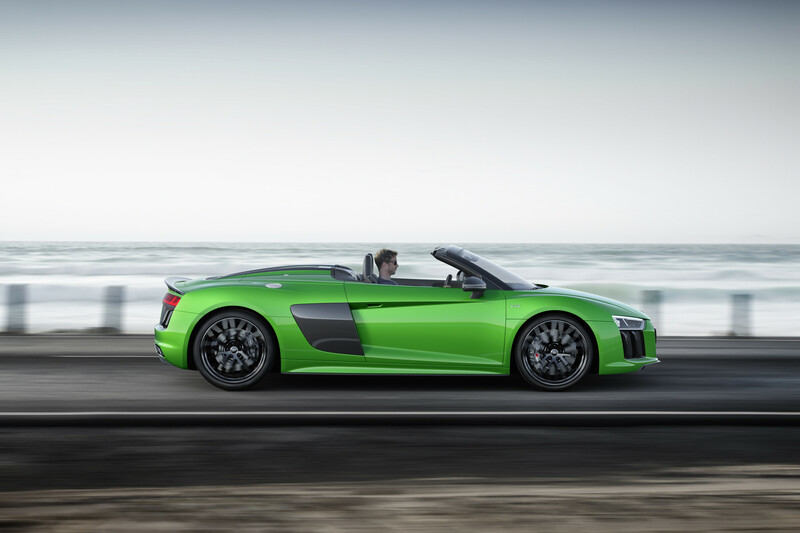 No one was complaining about the R8 Spyder...but they'll be complaining even less now. While wealthy sports car fans who saunter into Audi showrooms to survey the brand's super-coupe have been able to choose between the $162,900 R8 V10 and the $189,900 R8 V10 Plus for some time now, anyone who ventured by in search of an open-top supercar has been stuck with the mere 540 horsepower of the "regular" R8 Spyder V10. (Granted, it's not that much of a problem, as the second-gen R8 Spyder has only been on sale for a hot minute, but we're sure somebody out there has been disappointed.) 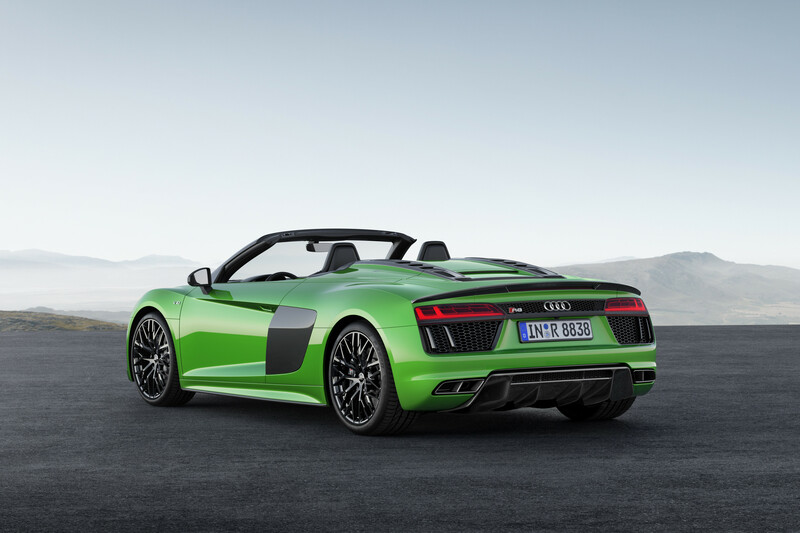 No more, however: Audi has officially unveiled its drop-top range-topper, the R8 Spyder V10 Plus. 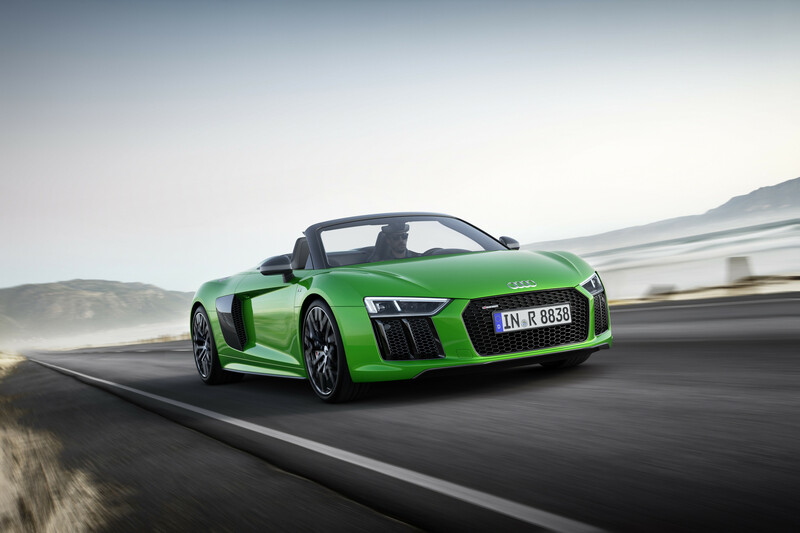 As you'd expect from the ever-reliable Germans, the basics of the Audi R8 Spyder V10 Plus should be more or less apparent to anyone familiar with Audi nomenclature. Like the hardtop R8 V10 Plus, it's powered by a naturally aspirated 5.2-liter V-10 that revs to a screaming 8,700 rpm, making 610 horsepower and 413 pound-feet of torque. 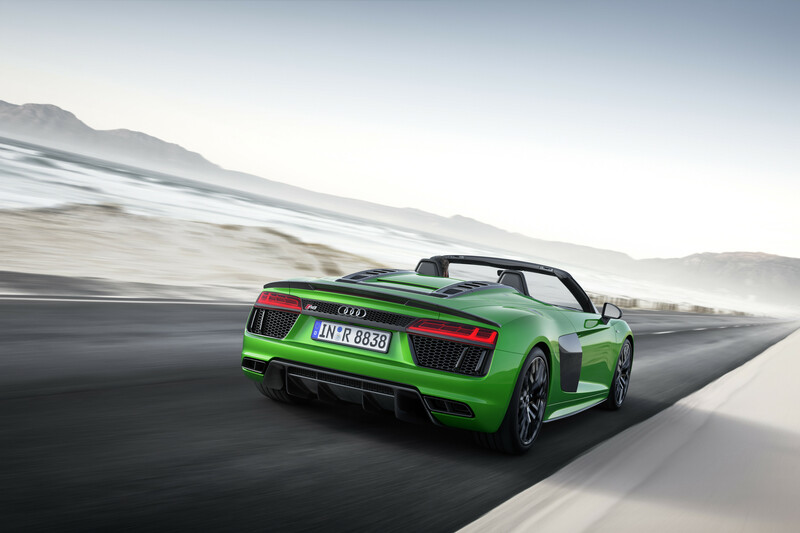 Combined with a seven-speed dual clutch gearbox and the requisite quattro all-wheel-drive system, and the R8 Spyder V10 Plus sprints from 0 to 62 miles per hour in a quoted 3.3 seconds—three-tenths faster than the non-Plus Spyder. Stay on the gas, and it runs out of pluck at 204 mph, six miles per hour faster than the lesser version. Anyone familiar with the other members of the R8 clan will likely see plenty they recognize in the new roadster's description. 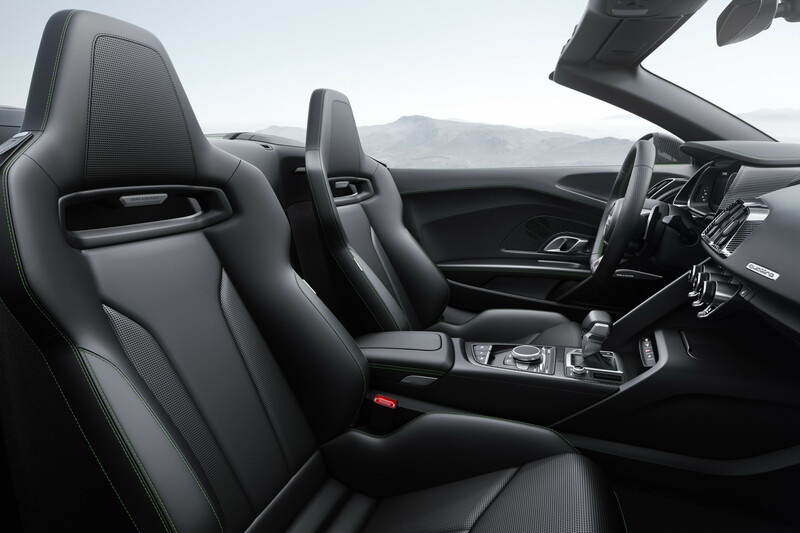 There's the requisite virtual cockpit with its 12.3-inch instrument panel screen, the usual power soft top that folds up or down in 20 seconds at speed of up to 31 mph, the optional laser beam headlamps, the multi-mode drive settings that let the pilot dial the car's aggression up or down with the move of a finger, the optional magnetorheological dampers, and the bangin' Bang & Olufsen stereo system. 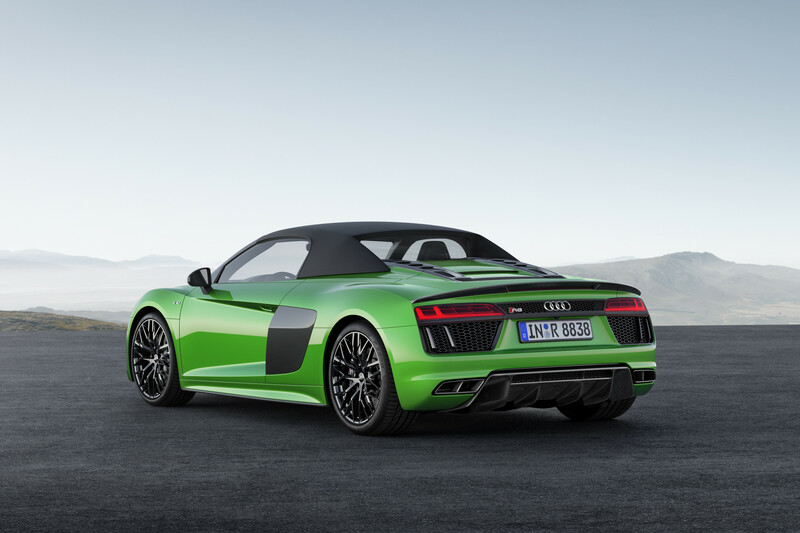 The R8 Spyder V10 Plus also offers what the press release describes as the "Audi exclusive micrommata green design package," which, considering it's a trim package combing a special green paint and interior accents with dark-colored trim, is basically just a fancy way of saying "Green Lantern colors."